The diagram in the left is the resignation one when Moriuchi drop a Gold on 6g. 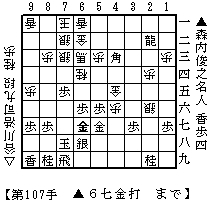 It is not a simple position why Tanigawa resigned the game since Tanigawa's castle seems still solid. Let's examine the position in details. Neglecting pawns, Sente had material advantage such as gaining a Rook for Silver. And, Gote would not be able to save his kNight on 6d from next Sente's pawn advance from 6d to 6e. More loss of material would be inevitable. So I think Tanigawa lost his fighting spirit under the circumstances of the position.